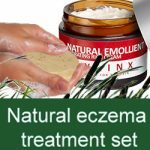 Many families are on a seemingly never-ending search for a safe and effective natural solution for eczema and other related skin conditions. 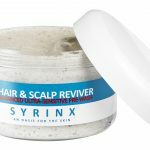 Finally, the search can be over – the Syrinx Za Natural Emollient brings an end to seemingly endless irritation by providing skin with a new lease of life for any sufferer, no matter what age. Our Natural Emollient can naturally moisturise and rehydrate the skin while removing toxins and impurities, targeting the root cause of the problem, while the Sapropel helps to boost the skin’s own immune system. 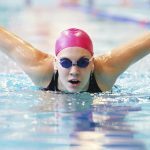 Many emollients contain artificial colours and alcohol additives which can often worsen the skin’s problem rather than help it, particularly when used on children’s delicate skin. 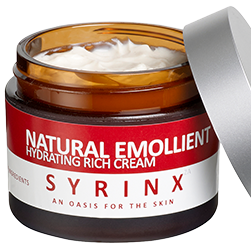 Syrinx Za’s Natural Emollient is formulated to achieve the very opposite. Chemical-based products can cause irritation, redness and rashes, and can even leave the skin worse off than it was to start with. 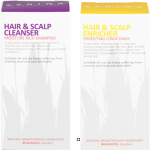 Our Natural Emollient is, therefore, a completely natural and chemical-free alternative to such harsh products. Our breakthrough ingredient Sapropel, a rare glacial lake sediment, ensures the emollient can naturally yet effectively hydrate the skin and soothe conditions such as eczema, psoriasis, dermatitis and dry, cracked skin. Sapropel draws out impurities of the skin and approaches the root cause of problematic skin conditions. The Natural Emollient also contains Argan Oil, which compliments the Sapropel to give your skin the best results possible. 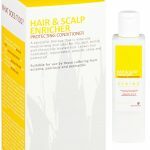 Argan Oil is botanical oil extracted from nuts in Morocco and is one of the world’s best sources of Vitamin E. When blended with Sapropel, the skin has a unique defence against troublesome skin issues and is widely used by those prone to eczema and other skin conditions. 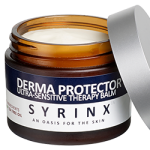 We understand how problematic sensitive skin issues can be, both physically and socially. We want to give you the freedom from the irritation, inflammation and soreness, the freedom to not have to spend hours on skincare, the freedom to shake hands and meet new people with a new found confidence. And that’s exactly why we have carefully designed our Natural Emollient to help you and members of your family. The gentle formula can be used on the face, ears, neck and other sensitive areas of the body. 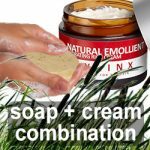 Thanks to its pure, natural and effective ingredients, the Natural Emollient is so much more than just an eczema cream; it could be a life-changing solution. An end to constant irritation…Natural and Family Safe. Our Natural Emollient Eczema Cream has a proven track record and is our most effective solution for eczema and other related skin conditions. It is extremely hydrating and double rich in Zander, leaving the skin feeling soft and deeply moisturised. And a new lease of life for any sufferer, young or old. 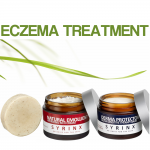 So we’ve created a natural and chemical-free alternative: Syrinx Za Natural Emollient Eczema Cream, containing Zander and Argan Oil. Zander, a rare lake sediment, fights against eczema by drawing impurities from the skin and restoring its natural moisture. Argan, a botanical oil extracted from nuts in Morocco, is one of the world’s richest natural sources of Vitamin E.
Syrinx Za Natural Emollient Eczema Cream uses the ancient healing powers of Zander and Argan to soothe and rehydrate the skin, removing toxins and impurities. It’s a gentle emollient for your face, ears, neck and other sensitive areas. And because our ingredients are pure and natural, it’s more than an eczema cream – it’s a perfect skin treatment for anyone who wants to look and feel their best. The damage to your skin can be healed, and the pain can be relieved. No blistering, flakes or scales, just use this cream every day, and enjoy life in a rejuvenated, healthy skin. This product contains traces of nut oils and may in very unusual cases cause an adverse reaction. If this is the case please stop using immediately. For best use we would recommend storing this product in a cool, dark environment. There’s no medically proven cure for eczema – but the symptoms can be treated. In clinical trials, this natural and rich emollient has greatly relieved the pain, appearance and irritation of dry and flaky skin. 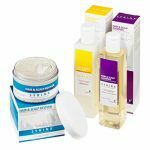 contact dermatitis – dry skin – eczema – seborrhoeic eczema – psoriasis – methotrexate psoriasis – dyshidrotic eczema – eczema herpeticum – infected eczema – discoid eczema. Works by: drawing impurities from the skin, increasing natural hydration and promoting cell rejuvenation. A gentle, natural hand cream for very dry hands and skin. This gentle soothing hand cream is our original formula for hyper dry-skin which contains slightly less Zander than our Natural Emollient Eczema Cream but is absorbed very quickly into the skin. Our dry hand cream solution is ideal for any dry and cracked skin on the hands and the body where fast absorption is important to the sufferer. Many hand creams contain artificial colours, alcohol and additives; so instead of healing, they can often irritate dry sensitive skin or even cause a rash. Our original formula, natural and steroid-free alternative: Original Natural Emollient Cream, containing Zander and Argan Oil. Zander, a rare lake sediment, fights against dry skin eczema by drawing impurities from the skin and restoring its natural moisture. 100% natural ingredients with no danger of allergic reaction our fast absorbing hand cream contains Zander for added benefit and no harsh chemicals!! 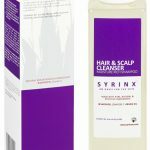 It’s also paraffin, paraben and chemical free. Our natural hand cream will protect and moisturise hands from the elements to leave them silky soft and ready to go to work within moments of application. 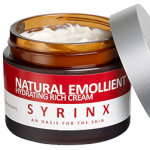 Syrinx Za Original formula Natural Emollient Cream uses the ancient healing powers of Zander and Argan to soothe and rehydrate the skin, removing toxins and impurities. It’s a gentle emollient for your hands and body. And because our ingredients are pure and natural, it’s more than a just a dry hand cream – it’s a perfect skin treatment for anyone who wants to look and feel their best. This product contains traces of nut oils and may in very unusual cases cause an adverse reaction. If this is the case please stop using immediately and contact us. A 100% natural ingredients offering an escape from the discomfort and inconvenience of dry or cracked hands and skin. In clinical trials, this natural and rich emollient has greatly relieved the pain, appearance and irritation of dry and flaky skin. Hand Cream to be the perfect combination of fast absorbing and non greasy.